Since this is our last episode of "Supernatural" for a while (the show returns January 21st, 2010), I do want to take a real moment to talk about the show and to map out what's really working, what's not, and why season 5 worries me so damn much. There are very real, very nasty SPOILERS ahead, so unless you're up to date, I'd tread no further. Like Mo Ryan said at the Chicago Tribune, the writers have really done a number on themselves this season, spinning a plot as intricate as it is epic, inventing a war that keeps getting bigger and bigger and a hoard of folklore that just keeps becoming more and more nuanced. I like all of this, but season five has not been impressing me so far, at least not as a worthy successor to season four, which was so perfectly paced, and it took its sweet time so well developing Sam and driving that wedge between him and Dean and really landing the emotional impact of that last scene when Dean is there and the Devil is about to escape from Hell. Season five of "Supernatural," so far, reminds me of season six "Buffy the Vampire Slayer," in which the writers had to yank themselves up by their bootstraps pretty hard after having just done a fabulous job with season five. Season five's writing was so good because of its pacing and its patience. The writers really succeeded by effectively pacing the longterm story line (Glory, Dawn as key) with minor to absolute tragedy (Riley leaves, Joyce dies) and with Buffy self-discovery (Fool for Love, Intervention), and then, they hurled the show's title character into a mystical energy lock, which killed her, and, essentially, left themselves with nothing to work with. "Buffy," however, has an excuse, since nobody was totally sure whether it would be back for a sixth season at all. When UPN picked it up, the writers took the wheels off, and the season got very bad (introduction of the Trio) before becoming quite good ("Once More with Feeling," the Buffy/Spike relationship), and then it got bad again toward the end and never really did get back to that point of sheer perfection in season five. It's not that I feel the "Supernatural" writers are losing the reins, or that, any moment, we're going to take a nose dive into "Lost" territory--the land of loose ends and wavering focus--but Abandon All Hope, the tenth installment of "Supernatural"'s fifth (and possibly final) season, while emotionally wrought and loaded with wonderful moments of tension and farewell, sort of picks us up, sends us forward (via FABULOUS scene with Mark Sheppard as the demon Crowley), and then drops us right where we left off. Lucifer walks the Earth. Big Bad is on his way. The Colt is useless, and the boys are powerless once again. All of these things make sense (the powerlessness, I mean), but the ending feels cheapened and sort of rushed, mostly because of that convenient little turn of events in "The Real Ghostbusters," when Becky Rosen tells Sam that Lilith gave the Colt to a demon named Crowley, a fact she'd learned by reading Chuck Edlund's Supernatural book series. 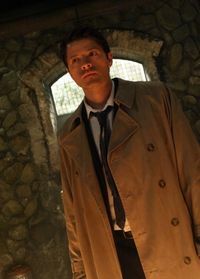 The book series is an element of the show initially introduced, I think, because it's funny, and this show loves to get meta, and also because it fits into the lore, Chuck is a prophet of the Lord, Castiel tells us in "The Monster at the End of this Story," and I thought that, while the idea of a prophet sort of makes things easier for the boys and the writers (if we know what's coming, maybe we can stop it), the whole thing just worked because, well, it makes sense that, if Sam and Dean are going to be such heavy hitters in the last battle on Earth, there would be a prophet somewhere on Earth to guide them. It's then so distinctly "Supernatural" that the prophet would write a low-circulation, cult following series of books about the fate of Sam and Dean. Let's get meta! 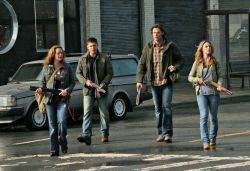 This is an instance where the mythology of "Supernatural" meets and plays a major role in the show's flare for the metafictional and the self-reflexive. That's part of what makes "Supernatural" so smart and so unique to any other series on television today. But oh, that moment in "The Real Ghostbusters" when Becky just drops that expedient bit of knowledge right into Sam's hands--that pissed me off. Never before have the writers sort of plunked the show into such overt convenience and instant directionality. "Supernatural" is about many things, one of them being the quest, the odyssey, and its long bouts of maddening hopelessness, searches that span seasons and absolutely ZERO breaks for our Winchester boys (Why should they get breaks? They're Odysseus in this story.) do not in any way add credibility to the fact that a minor character used for comic relief just gave them a major break in their case--a break that would have made more sense had it been unloaded on them MONTHS ago, maybe even last season. I would have believed a season's worth of searching for Crowley any day, and that, too, would have made Mark Sheppard's appearance much less sudden and much more gratifying in Abandon All Hope. It did seem to me that the writers felt trapped by their own handy-work, and that this was their way of digging themselves out. It doesn't work, however, and it effectively defuses much of what this episode tries to achieve: hopelessness in the face of the Devil, who, it turns out, is one of the few things in the universe that the Colt cannot kill. Also, since so much of this series has been so dependent on the Colt and finding the Colt and everything that the Colt means, and how it is the boys' last real connection to their father (as it's one of the last things he touched before he died) and by extension any life they had prior to this whole Michael vs. Lucifer ordeal, I will believe that they are able to obtain the Colt with ease from a rogue demon named Crowley, I will not believe that they didn't spend a season searching for him first. I've always admired "Supernatural" for its pacing, and its unwillingness to let up on the hardships it's caused its main characters, but this season is in trouble. It shows. I think this episode is successful in many ways, but I also think that parts of it squashed its own momentum, and the empty cliffhanger in the end only served to annoy me, because it felt exactly like the cliffhanger at the end of the season four finale, and we've made it this far, so naturally, I'm not worried. Or, well, I'm not worried in any way that feels new or complicated. "Supernatural" is at its best when it feeds on our more human, emotional fears--not fears that are sort of unmanageable, like that of the Angel of Death, or Lucifer walking on Earth. The best scene in Abandon All Hope is surely Dean's farewell to Jo, which is milestoned with a kiss and carried by its performances: Jensen Ackles and Alona Tal make the moment into terrible heartbreak. No words are exchanged between them, but the moment resonates, because we know what Dean has lost--everything, everybody close to him. His relationship with Jo, while one that never really came to any romantic fruition, is super important, because it is the only real relationship he's had with a woman for a long time. Also, they don't just sleep together during their last night on Earth (a great decision by the writers, might I add), and they haven't slept together before. Because Dean has continuously been characterized as a kind of skirt-chaser, this really works, and it makes me think back to that first time we met Jo in 2.2 "Everybody Loves a Clown," and how it was right after Sam and Dean's father died, and Jo asks Dean if she's ever going to see him again. Dean replies, "Normally, I'd be hitting on you so fast, it'd make your head spin. But, uh, these days...I don't know." Jo smiles. Tal is so perfect for this role, because she's beautiful and scrappy, blonde and waifish without ever seeming ethereal. She is not unattainable. She is a real girl, maybe the first real girl who's ever really approached Dean--let's not forget that she approaches him in this scene--and when she chalks up Dean's rejection to just "wrong place, wrong time," we know that whatever might have happened between them, probably is never going to happen, but their connection (again, carried by its stellar performances, makes me sad she's been killed off) is still not defused completely. The show never does forget about the attraction between Dean and Jo after that, but it's always done such a great job with hopelessness, and with this idea of "wrong place, wrong time," that while we're rooting for them, we know they'll never be together. And that's part of the incredible sadness of this moment in Abandon All Hope. That's all I want to get at right now. This episode is great in many ways, but I feel it lacks the pacing and momentum and some of the resonance that episodes like "Lucifer Rising" and "The End" really nail. I hope the writers figure out the true directionality now, not just of this season, but of Sam and Dean who, I think, have fallen a bit by the wayside in these past few episodes. Of course, they're present in the scene, but the tensions between them have been a little forgotten, and so has Dean's turmoil over having been to Hell, Sam's turmoil over having betrayed his brother, and the ever present loneliness factor. They have nobody to love them, besides Bobby, of course, and each other, and now with Ellen and Jo gone for good, the women in their lives have all been lost. They've all died terrible deaths, and I hope that the show addresses this, because I think it's very important. I am a little worried how season five is going to play out too. I'm not really disappointed by it, but I think it could be so much better than it is right now. I am worried that writers aren't exactly sure what will happen in the end and so they keep adding twists and facets to the storyline which will only complicate things further. I think this can be an amazing season but, like you said, they're having trouble with pacing and it may be rushed at the end. I really hope it doesn't though, especially if this is the last season. (I SO hope it isn't.) Great post, you really know your TV. Impressed.